Meet the queen of Buscalan in the Cordillera mountains, and the master weaver of Lake Sebu: two craftswomen most deserving of our highest regard this Women's Month and beyond. “The Filipinos are extremely capable in any handicraft—there are excellent embroiderers, painters, silversmiths, and engravers whose work has no equal in the Indies, and could be considered elegant in Paris and Rome,” wrote the Spanish Jesuit priest and cartographer Murillo Velarde in his 10-volume series on world geography entitled Geografia história (1752). Craftsmanship in the Philippines goes back to pre-colonial times. Filipino artisans express themselves through pottery, engraving, basket making, sculpting, and weaving by using bamboo, rattan, earth-based clay, abaca fibers, shells, and dye made from indigenous leaves and roots. What they produce are prized for their craftsmanship and sophistication. The anthropomorphic pottery urns excavated from caves in Maitum, Sarangani Province in Mindanao date back to the Metal Age and are currently displayed in the Museum of the Filipino People in Manila. The Boxer Codex (c. 1595) is a manuscript showing the intricate designs of Visayan pintados, or indigenous people who wore tattoos as a sign of their warrior status. Artisans from the Philippines continue to be among the most talented and creative in the world, and two women come to mind when talk comes down to some of the most beloved and most admired of this lot: the famous Whang-Od, the oldest Kalinga tattoo artist, and Lang Dulay, a T'boli master weaver from Lake Sebu who passed away in 2015 at the age of 86. In the thatched-roof village of Buscalan in the Cordillera Mountains, 98-year-old Whang-Od practices traditional Kalinga tattooing by hand, tapping a mixture of water and soot scraped from the bottom of a cooking pot onto the skin using a gisi, a lemon thorn attached to a bamboo stick. 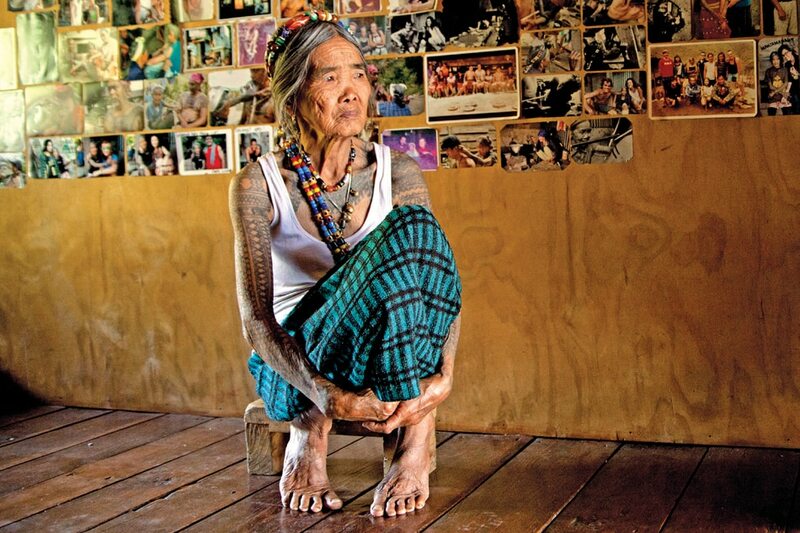 Whang-Od learned the skill when she was 15 by observing Wha-gay, a Kalinga warrior and mambabatok, or tattoo artist. Though it was uncommon for women to practice the art, Whang-Od persevered. Today, what was once a dying tradition has been revitalized with local and foreign tourists flocking to Buscalan to learn the skill and to receive the gift of a Kalinga tattoo from Whang-Od herself or from Grace, her grandniece and apprentice. Whang-Od said tattoos are a source of pride. For Kalinga men, tattoos originally signified their warrior status or symbolized protection. For women, they were adornment. “When I die, I bring nothing else with me but my tattoos. They have become part of me,” she said. In 1988, the National Commission for Culture and the Arts designated Lang Dulay as a National Living Treasure to honor her legacy as a master weaver of t’nalak, the traditional woven tapestry of the T’boli indigenous people in South Cotabato. 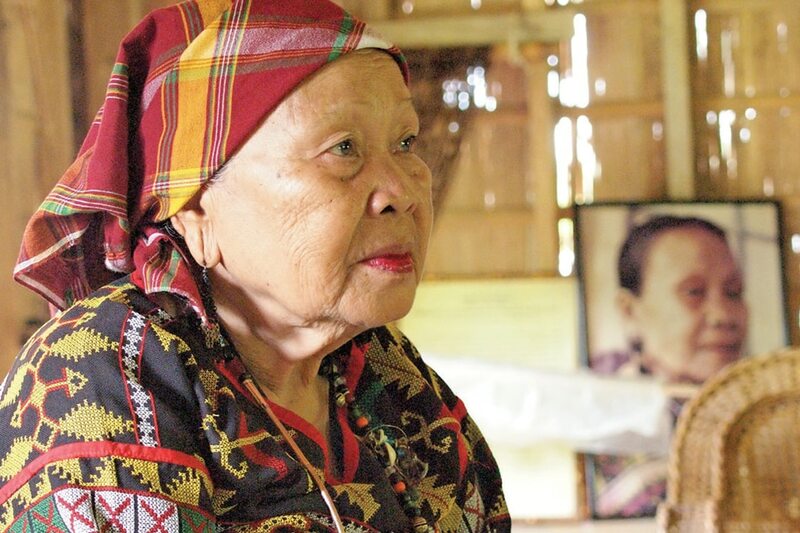 Before her passing, she has bequeathed her knowledge to her School of Living Traditions in Sitio Tukolefa, Lamdalag in Lake Sebu. She learned how to weave at the age of 13 from her mother, continuing an age-old tradition. Lang Dulay from South Cotabato. T’nalak is made from fiber stripped from the abaca tree. While damp, the fibers are kneaded by hand then hung to dry before they are finger-combed, measured, cut, and tied to create the weave patterns in a process called sumdung. The fibers are then dyed red and black. The dyes, boiled in a kettle for at least two weeks, come from the roots from the loko and kanalum trees. It takes four months to complete a single tapestry. The weaving method involves a backstrap loom, which requires the weaver to use swift, repetitive movements to pull back the warped threads. T’nalak designs are informed by patterns seen in dreams, either from those of the weaver or passed down from her ancestors. “We cannot name or measure when it was started, but since the T’boli people existed, there was this art of weaving,” shares Lang Dulay.